Would The U.S. Withdraw Troops From South Korea? : Parallels President Trump has said U.S. forces are not on the table for potential negotiations with North Korea, but he has also complained about the cost of keeping them there. Would The U.S. Withdraw Troops From South Korea? U.S. and South Korean soldiers sit inside an amphibious vehicle during an annual joint military landing exercise in Pohang, on South Korea's southeast coast, in March 2016. American troops have been stationed on the Korean Peninsula for nearly 70 years. More recently they've become something of a political football. North Korea wants them out as part of any nuclear deal. South Korea wants them to stay to help with its defense. And President Trump is considering reducing their numbers to save money. When the president recently canceled the planned summit with North Korean leader Kim Jong Un, U.S. defense spending in the region was also apparently on his mind. He said South Korea and Japan are not only ready should North Korea take any "foolish or reckless acts," but those countries would "shoulder much of the cost of any financial burden" on the United States for any military operations. The U.S. has about 28,000 service members on the Korean Peninsula. Currently, the operations they engage in are for training. Each year, U.S. and South Korean troops dash along a wooded trail at a training range north of Seoul. Some fire machine guns and launch mortars. Others are in tanks or warplanes, trying to push back an imagined invasion. It's an annual exercise called Foal Eagle and thousands of soldiers take part. "You are trying to coordinate and synchronize artillery, maneuver, direct fire from tanks and helicopter," says retired Army Gen. Walter "Skip" Sharp, who commanded U.S. forces in South Korea for three years until 2011. "And all of that being done in a live-fire scenario. You'll bring targets up in sequence like someone is attacking." That someone being North Korean forces, streaming across the border. Sharp says Pyongyang complains each year about Foal Eagle. But they conduct similar live-fire scenarios. "They have exercises very much like this," says Sharp. "They have a winter and a summer training cycle." Still, North Korea recently canceled a meeting with South Korea because of the Foal Eagle exercise, charging it was a dress rehearsal for an attack on the North, and brushing aside U.S. officials who said the exercise is only defensive. And the North has also suggested U.S. troops should be removed as part of any deal to eliminate its nuclear weapons program. The South has said the U.S. military presence should not be a bargaining chip, and that any reduction of American troops should be decided separately between the governments in Seoul and Washington. President Trump recently told reporters that U.S. troops were not on the table, but he still complained about the expense. "Now I have to tell you at some point into the future, I would like to save the money," Trump said. Analysts say South Korea spends about $800 million a year for U.S. forces, about half of the cost. 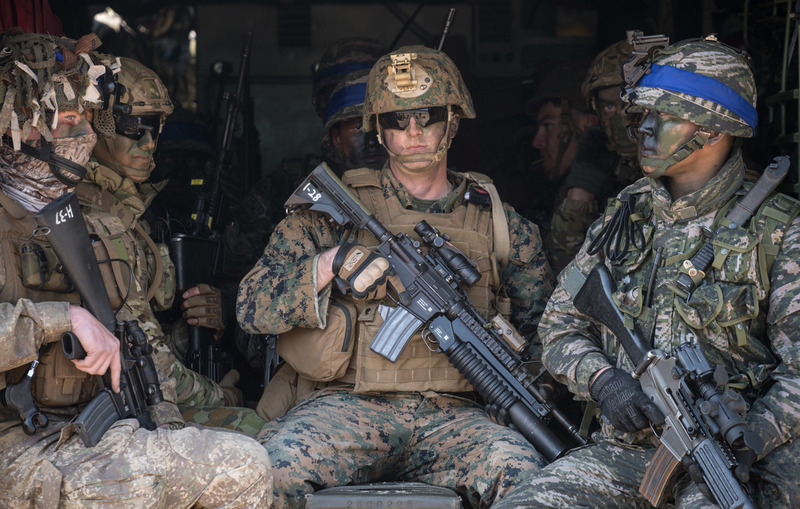 All the talk about American forces there raises the question: Why does the U.S. still need troops in South Korea, a country which has created a formidable military that takes part in peacekeeping missions around the world? Sen. Roy Blunt of Missouri posed this question to Defense Secretary Jim Mattis, appearing before a group of lawmakers earlier in May to discuss the president's 2019 budget request. "What do you see as the importance of our presence, not only in the Korean Peninsula but also in our regional presence?" Blunt asked. "The presence of our forces there is a stabilizing presence," Mattis said. "The Americans are committed and this resonates among allies." American troops in South Korea are not just there to halt an attack from the North, but to protect allies like Japan. Victor Cha, who was an Asian affairs adviser to former President George W. Bush, supports that. "Whether we like it or not, since the end of World War II, the United States has been a Pacific power in Asia that has maintained its credibility and its commitments to governments in the region by our troop presence there," Cha says. America's troop presence also has economic considerations, he explains. "I mean that has been the nature of the U.S. commitment to show that we will be there to protect sea lanes to prevent the rise of another hegemon in the region," says Cha, "and that has stabilized not just the politics of the region but also the markets." But Doug Bandow, a foreign affairs analyst who worked in the Reagan White House, has another view of U.S. troops in South Korea. "Well they're no longer necessary," says Bandow. They were, he says, back in 1953, when an armistice was signed to cease the Korean War, the South was weak and the war could have reignited. At that time there were some 327,000 U.S. military personnel there. "You know today, South Korea has something around 45 times the GDP [and] about twice the population of the North," says Bandow, "so there's no reason why the South cannot build a military sufficient to deter and somehow defeat, if necessary, the North." There are plenty of U.S. service members elsewhere in Asia but the ones in South Korea, he says, just aren't needed. "They don't add much to South Korea's defense," Bandow says. "They simply allow South Korea to spend less on their military." This isn't the first time a president has suggested removing U.S. troops from South Korea. President Jimmy Carter raised the idea in the 1970s, partly as a way to save money. His advisers strongly opposed it, including an American general in South Korea — who was removed for criticizing the plan.